Read the first part of our family’s story about preparing for the NDIS and having the first planning meeting here. It took a couple of weeks for the plan to come through. In fact, I called the NDIS main number after two weeks and was told there was a plan in place already. I was given an activation code to join the participants portal on the NDIS website. A letter arrived a couple of days later with this same information. To read more detail on what each means, the best place to look is the current NDIS price guide. Most of my son’s supports are for this. The aim is to make him more able to be independent and for him to end up as a tax payer who no longer needs support from the NDIS. This is the equivalent of the NSW Transition To Work program which was a two year program. So this will last for this year only and will all be paid to Fighting Chance, where he had started his old Transition To Work program. This will fund the psychological support my son needs which helps him to manage his behaviour. He has quite a few challenges and I don’t think this amount is enough for the costs of the support he will need and get this year. I have called the main NDIS to get more clarification; however, the person I talked to couldn’t help and said he would email my local office and ask them to contact me. Two weeks later – no response! So I emailed the Chatswood office myself on 16th March, we will see if I get some clarification. I think we need to use this to do a good assessment of Tom’s daily living skills and we can check in a year to see how they have improved. This is an area where my son needs HEAPS of help… I do a lot with him in this regard myself but I think that support from another person might work better. I need to find someone to help him! My son does need help when going to new places and working out some transport issues but transport is not his biggest area of need at all so I need to confirm if it can be used for any skills development we choose. 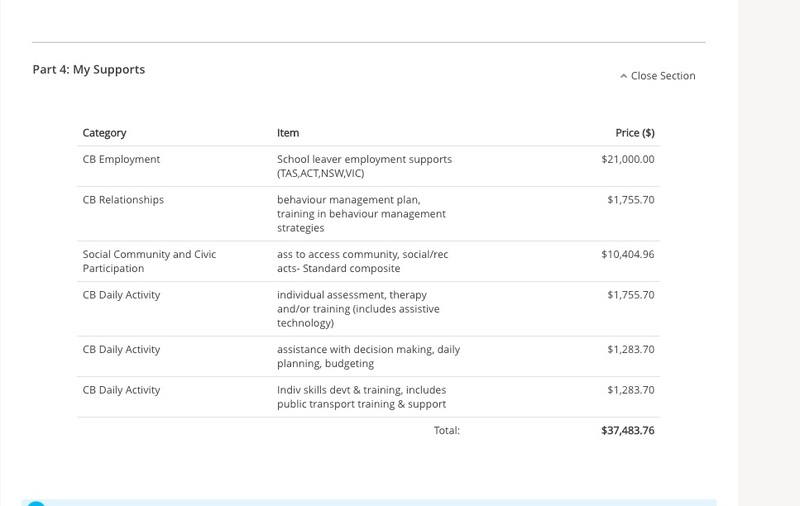 Next post details using the NDIS portal, some issues so far, what we’ve spent money on so far and how we are keeping records. Click here to read. Interesting read. Thanks for sharing. Did you happen to get clarification around Social Community and Civic Participation? Hello Alison, we’re still waiting but will pop up when there are clear answers. The answer came, I called the local contact… anything which directly relates to the GOALS… so actually that is fine. If something is going to help in achieving the goals then it can be claimed.